Waterparks are currently on a mile-a-minute journey to superstardom, and it’s one that’s been built up to for a while to reach that exact eventuality. Their breakthrough EP Cluster earlier this year provided the earliest signs with its big-name alumni like Good Charlotte’s Benji Madden on production duties and Mikey Way of My Chemical Romance lending his services as session bassist. Coupled with some absolutely monumental pop-rock tunes at their disposal, and the Texan trio’s path to their debut full-length Double Dare has seen their profile inflated by a colossal degree, one which, if everything goes right with this release, should make Waterparks utterly inescapable. And honestly, there’s no reason why everything shouldn’t go right, as Double Dare is a triumph of a pop-rock album, and Waterparks’ one way ticket to the most major of major leagues. And that’s because with every single factor on this debut, they’ve got it nailed right off the bat. To start off, let’s compare Waterparks to the similarly hotly-tipped pop-rock band With Confidence. Their debut Better Weather earlier this year showed heaps of potential, but a sound that was only inching towards their own identity and felt quite loose-ended. The difference between them and Waterparks is that this feels like a completely recognised sound already, one that draws on copious levels of Fall Out Boy and Panic! At The Disco, both circa 2005, and melds them into its own jubilant, electro-coated pop-rock beast. The lyric “I like happy songs with titles that don’t match at all” on Gloom Boys sums this album up pretty neatly, as frontman Awsten Knight is clearly subscribed to the Wentz / Urie method of songwriting, namely with meticulous lyrical detail and just by being far too clever for his own good. It’s a lot more well-rounded in terms of focus, having a wider range of sight than the typical done-to-death pop-rock clichés. And though plenty of songs about girls and relationships do surface here, and jump through fewer lyrical hoops that some of the album’s more adventurous material (Stupid For You is literally about Knight being so madly in love with this girl that he can’t think straight), there’s a sharper, more tactile wit to the writing that sets them apart in lyrical dexterity alone. Of course when they cast their net out further they find a lot more room to explore – the usually foolproof combo of inner dissent set to stupidly catchy melodies hits the mark yet again on Hawaii (Stay Awake) and 21 Questions – but it’s Little Violence that paints Waterparks as a band already beyond their years. Instrumentally there’s a prominent punk flavour that complements its biting lyrics which, in a move not dissimilar to something Fall Out Boy would’ve done in their early days, seemingly chastise the band’s own genre for its overall vapidity and lack of imagination. For a band to come out with swipes to their own peers on their debut takes some real guts, but Waterparks actually manage to pull it off with the fire it needs. But obviously one’s enjoyment of Double Dare doesn’t hinge on its lyrical content; on a purely aesthetic level, this is one of the most joyous, immediately likeable albums to drop this year, purely because of a near constant stream of gigantic hooks. Of the thirteen tracks on this album, not a single one will leave your head without a fight, jostling around with chorus after chorus of sugary pop-rock goodness. The good thing about this album though, is that compared to many of their contemporaries attempting to do the same sort of half-and-half fusion (hi Against The Current), Waterparks actually feel like a band – the guitars aren’t polished to a sheen, and there’s a tiny bit of gristle to the synths that allows them to buzz rather than just lay stagnant at the very top of the mix. The ratio between pop and rock is kept in check throughout, with the former hardly ever overtaking the latter (Take Her To The Moon is the sole exception, going for an alt-pop club rager but ending up like a crossover between Hellogoodbye and the thankfully defunct It Boys). There’s a bit more meat on these tracks, leading to the likes of Royal and especially Plum Island having greater longevity than just another blank-faced pop-rock track. And that’s how this genre should be done, not pure pop with a few guitar licks thrown in, but with a crunchy, melodic focus bolstered by pop’s playfulness and desire to explore. Waterparks have understood that on their first attempt at something substantial, and it’s no surprise at all that they’ve coming flying out of the traps. 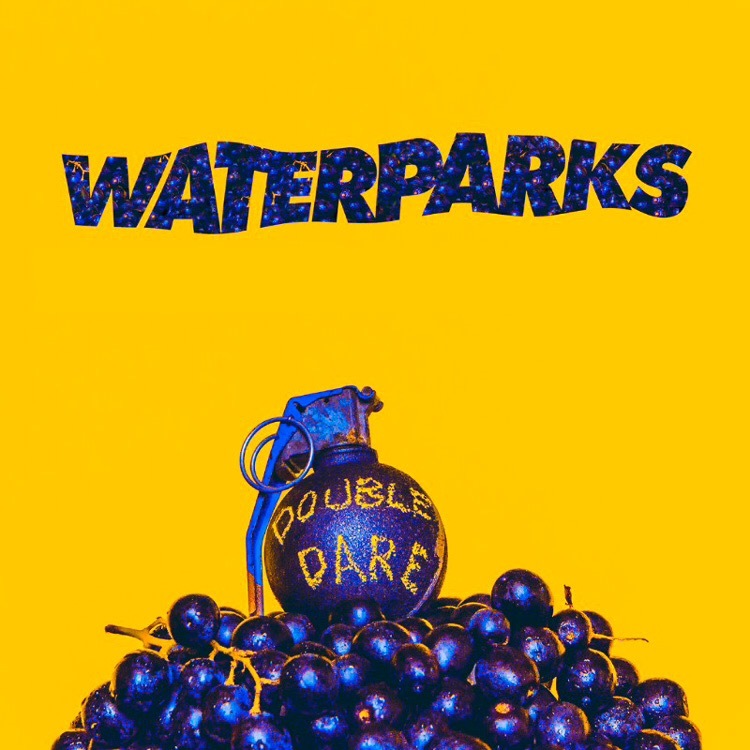 Double Dare is the best pop-rock album of the year, one of the best albums of the year overall, and the kind of rare release brimming with both style and substance that shows that Waterparks have pretty much got it made at this point. Seriously, it would be stupid to bet against them at this point, especially when they can capture lightning in a bottle the way they have here. ‘Double Dare’ by Waterparks is released on 4th November on Easy Life Records.